Illustrations of nine types of row houses found in Washington DC with daubs of color. Digital print on heavyweight paper. Frame not included. Print fits in a standard 8x10” frame. Actual colors may vary from appearance on screen. Every monitor is different. Reproduction and resale of artwork is prohibited without prior approval from Lunch City Studio. Welcome to Live Buy Local, the online marketplace that brings locally made home goods to your fingertips, no matter where you are. We're proud to connect shoppers with sellers who share a passion for one-of-a-kind, beautiful items for the home, all in support of local businesses from coast to coast and every state in between. At Live Buy Local, we’re redefining the meaning of shopping local and giving the power to you by offering a curated selection of home items made locally around the country, so you can choose where your purchase is designed and made. 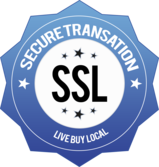 ©Copyright 2017 by Livebuylocal. All Rights Reserved.